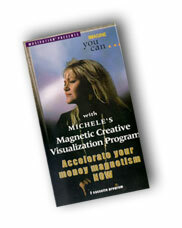 Here Michele uses her MusiVation™ technique combined with creative visualization. This is an extremely powerful tool to accelerate the mind to new thoughts of wealth and prosperity. The subconscious thinks in pictures so utilizing MusiVation's visualization technique allows your subconscious to literally see your dreams on the screen of your mind. Watch Michele now on video explain the benefits of this amazing product.